A RUP LIFE: Quilts of Love ~ A GRAND DESIGN #bookreview PLUS Kindle HDX Giveaway & “Fall into Fall” Facebook Party! Quilts of Love ~ A GRAND DESIGN #bookreview PLUS Kindle HDX Giveaway & “Fall into Fall” Facebook Party! 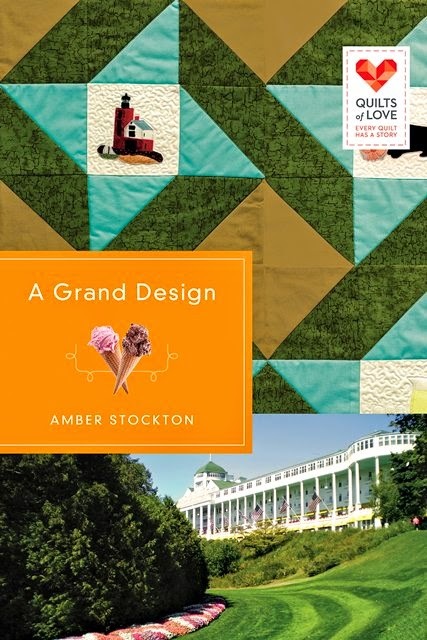 I had the opportunity to read the Quilts of Love book, A Grand Design by Amber Stockton. This book deals with struggling to let painful memories go and move into God's healing? Set on historic Mackinac Island. There were so many parts of this book I loved! The setting was fabulous! I would love to visit Mackinac Island after reading this book. Alyssa wasn't my favorite character at first. She was very insecure but with everyone else around her making up the slack - until she gets her confidence back - I found myself liking her more and more through out the book! Scott was a fabulous romantic lead! I was routing for him! I hope we see her Grandmother pop up more in the series! Lastly I loved the little bits and pieces of story about the quilt. Sometimes books with a craft theme element overwhelm the reader with too many details but Stockton had a beautiful balance with this one! This really is a cute summer romance read! I thoroughly enjoyed it. A getaway on a charming island may be just what Alyssa needs---if only she can let go of her past. When Alyssa Denham, a single career woman, wins a fun getaway for two on Mackinac Island where her grandmother lives, she gives her carefree best friend a call. Together, they tour the old shops and hidden treasures of the quaint island while helping Alyssa's grandmother piece together an heirloom quilt. Their quest gains them entrance into the homes of many longtime residents of the island, parts of the city that are otherwise off limits to tourists. As the quilt's story takes shape, Alyssa gains amazing insight into her grandmother's life . . . and attracts the attention of the handsome Scott Whitman, an island resident in charge of hotel transportation. Will memories of her past keep Alyssa from letting go? Or will the quest to piece together the heirloom quilt restore Alyssa's fractured heart---and bring healing to her entire family? Amber Stockton is an award-winning author, a national speaker, and a direct-sales brand partner with Nerium International. She lives with her husband and fellow author, Stuart Vaughn Stockton, in Colorado. They have a daughter and a son, and an Aussie/retriever mix named Roxie. Three of her novels have won annual reader's choice awards. Celebrate August’s release by entering to win a Kindle from Quilts of Love and RSVPing for the "Fall into Fall" Facebook auth chat party. Enter today by clicking one of the icons below. But hurry, the giveaway ends on September 16th. Winner will be announced at the "Fall into Fall" Facebook party with Amber Stockton and Robin Caroll. RSVP for an evening of book chat, quilting tips and tricks, prizes, and more! RSVP today and spread the word—tell your friends about the giveaway via FACEBOOK or TWITTER and increase your chances of winning. Hope to see you on the 16th!